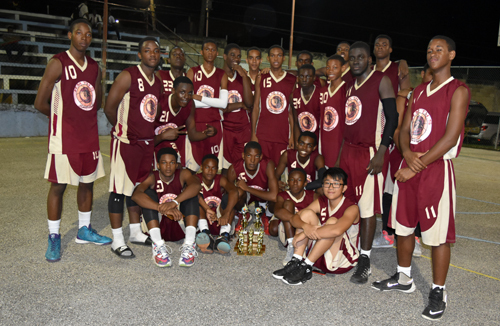 For the fourth straight year, the irresistible and seemingly unstoppable Hebert Morrison Technical High (HMTHS) are double champions of the ISSA Western Conference Schoolboys Basketball Competition. The Bogue-based school, under the tutoring of coach Dave Black, racked back-to-back-to-back-to-back holds on the western titles with wins in the championship games on Friday at the Montego Bay Cricket Club, clinching the best-of-three finals 2-0. In an at times temperamental affair, Herbert started the day in fine style, successfully retaining the Under-16 crown with an efficient 47-33 victory over former champions William Knibb. The contest which provided good all round basketball by both teams, almost descended into a farce, and was held up for just over three minutes due to a call by the officials which incensed the William Knibb coach, Ronald Beckford. Beckford was eventually ejected from the court because of his protest, with the assistant taking over as they completed the clash. Two of William Knibb’s top players were ejected from the contest as time expired. Anthony Thorpe led the way for the Herbert team, scoring with a big doube-double, 18 points and 21 rebounds, while Taj Hewitt added 10 and bagged 15 rebounds. Darren King, a monster on the defensive end, ended the finale with 15 rebounds while contributing six points. Rhondane Ashman, who was named Most Valuable Player of the Under-16 division, had 14 points, 10 rebounds and 5 steals for Knibb. Meanwhile, the Under-19 giants then made sure that the Herbert team celebrated long into the night when they strolled to a smooth 70-55 triumph over Spot Valley in their Game Two to also take the series 2-0. Spot Valley were testing early on and asked questions of the champion defenders, raining in four three pointers in the first half of the match, before somewhat petering out as Herbert took charge and showed their class. Herbert held a solid 57-45 lead heading into the last quarter, and added just a further 13, marching to the win to the delight and great satisfaction of coach Black. The electric Brandon Dawkins led the way with 21 points, while Most Valuable Player Alek Gilchrist, dominant on the boards, added 15 points and hauled down 18 rebounds. He also had 6 assists and effected six steals as he ran the courts tirelessly playing the entire game. David Gordon supported with 19 points and grabbed 6 rebounds. Roger Hines was Spot Valley’s top scorer with 18 points. Cornwall and Muschett finished third in their respective divisions. The finalists now turn their attention to the All-Island Playoffs set for later this month.